Collector Zone > NEED ALL CHARLIE WHITEHURST! Full Version: NEED ALL CHARLIE WHITEHURST! I NEED ANYTHING AND EVERYTHING OF CHARLIE WHITEHURST YOU CAN FIND. IF YOU HAVE ANY WHITEHURST PLEASE LMK AND WE CAN WORK OUT A TRADE. I need em both-- Who you collect? ultra whitehurst like vernon davis topps and something else man u owe me from tht last trade still havent recieved the second package of the deal. idk i know ur sorry but its been close to 2 and a halfe months. Have quite a few of his cards. Think the best I have is Topps Chrome. If you have any Maroney cards (other than Topps, Score, or TBTC) to trade, maybe we can work out a deal. No GU or Autos available. I've got SPx AUTO/GU and Topps Chrome Blue Auto /50. I need Tarvaris Jackson, Marcus Vick or 2006 MN Vikings RC cards. Let me know. 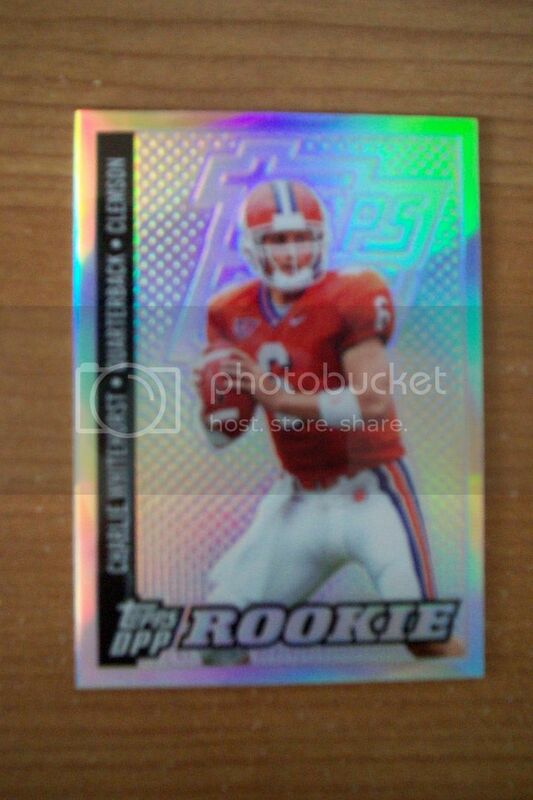 I have Topps DPP Chrome Refractor.